Many investors are so focused on U.S. markets at the moment that they’re ignoring events taking place thousands of miles from our own shore. That’s too bad, because it means they’re missing out on what could be one of the greatest trades they’ll ever make. The groundwork was laid Sunday night and I just couldn’t wait to share it with you in today’s column. …more central bank meddling… double check. Let’s take a moment to make sure you understand why this is such a fantastic and potentially very profitable opportunity. Then we’ll move on to the trade itself. The last time we saw this set up it led to at least 150% profits. I’ve spent a good deal of my career travelling in search of the biggest and best investment opportunities I can find. To my way of thinking, there’s simply no substitute to first hand, boots-on-the-ground knowledge – especially when it comes to Japan, where I’ve spent nearly 30 years as a husband, father and, of course, analyst and trader. Incumbent Japanese Prime Minister, Shinzo Abe declared a landslide victory Sunday as his government’s party – the Liberal Democratic Party or LDP for short – gained a resounding 2/3rds majority in the 242-seat upper house, or House of Councillors, as it’s formally known. It signals that many Japanese have given up fighting for change, so they’re re-electing the same government that got the nation into the mess that it’s in today. It’s clearly a vote for stability, albeit one that’s going to cause a lot of discomfort in the Pacific Rim; Abe also wants to revise a specific clause in Japan’s constitution renouncing war, but that’s a story for another time. What matters is how this affects your money and the trade Abe’s victory sets in motion. If you’re just joining us, here’s a quick primer. Abenomics is very similar to the Fed’s meddling – er, Quantitative Easing – and is intended to be a comprehensive series of fixes for the Japanese economy. It’s comprised of three so-called arrows: structural reform, monetary easing, and fiscal stimulus. The goal is an end to more than 30-years of economic malaise. Unfortunately, Abenomics is not working. 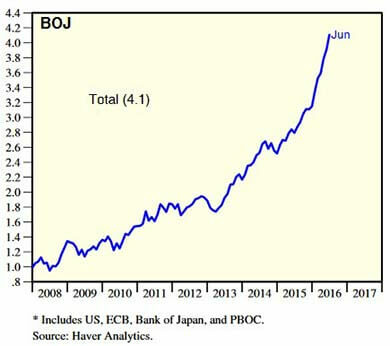 Since 2012, Japanese central banking assets as a percent of GDP have exploded from around 40% to nearly 100% of Japan’s $4.4 trillion economy today. Deflation has not been broken and the GDP deflator dipped in January, showing that prices for domestically produced products and services fell yet again, just as they have for years. Growth is anemic at best. Petrified Japanese consumers are saving as much as they can instead of spending, which means that there’s no domestic consumption to speak of… and there hasn’t been for years. Corporations are doing much the same thing, and in 2014 were sitting on an estimated 229 trillion yen in cash or roughly 44% of GDP, according to The Economist. Incidentally, I’ve heard unsubstantiated reports that the number may have reached 50% of GDP in recent weeks. To break out, Abe’s got to trash the yen. He can’t just devalue it, he’s got to take it down by an order of magnitude from where it is today, at roughly ¥104 to $1USD. Unlike America, which made the decision to be a consumer nation after WWII, Japan decided to rebuild its nation by concentrating on exports which, in turn, would drive manufacturing and consumption. Most of Japan’s industries today owe their very existence to promotionist policies of the 1950s and 1960s. The most commonly-cited examples include high-value exports like automobiles, electronics, semiconductors, robots, and other machinery. Unfortunately, Japan went off the rails in the 1970s and, in doing so, stopped building up the winners in favor of protecting the losers. What I mean by that is that Japan began protecting lesser domestic industries despite the fact that they’d grown inefficient by global standards. Examples include construction, refineries, food processing, farming, steel, concrete, and other materials production. Shipbuilding and textiles are also classic examples. And here’s where the rubber meets the proverbial road. Japan’s protectionist policies sounded great in theory to worried voters under very similar circumstances to those we face here now but they haven’t worked out. In fact, the very same policies intended to benefit millions of working class Japanese crippled consumers by raising prices to obscene levels. I remember paying $60 for a melon, and client dinners costing well into the thousands of dollars back in the 1980s. At one point, Japanese real estate was so valuable that the land under Tokyo’s Imperial Palace alone was said to be worth more than all the real estate in California. The protectionist policies Abe’s LDP predecessors enacted that were supposed to save jobs had exactly the opposite effect, in that they’ve cost Japan millions of high-paying and high-productivity jobs. So much so, that most Japanese companies making high-input, high value items went overseas in order to save money and boost earnings. There are more Japanese cars made outside Japan now than inside, to give you an idea of what I’m talking about. What’s left is an economy dominated by low-value, low-productivity jobs that add very little to the export economy and create little or no domestic consumption whatsoever. Prime Minister Abe has one choice under the circumstances – devalue the yen or Japan dies. Remember, a cheaper yen makes Japanese products less expensive in global markets. If Abe wants to return Japan to prosperity, he has to devalue the yen to stimulate asset prices and growth in the real economy. The bet here is to short the yen. Like all politicians the world over, Abe wants to remain in power and that means he has to weaken the yen to keep his voters happy. Again, he has no choice. Now, you could do this by shorting the yen directly like many professional currency traders are doing, but that puts you in the proverbial shark tank with the big banks who would love to separate you from your money. Or, you could trade futures on the Chicago Mercantile Exchange, or another of the world’s futures markets. But you’ll have to put up a ton of capital and deal with potentially crippling margin requirements if you want to really juice the trade. I suggest something far simpler. The ProShares UltraShort Yen ETF (NYSEArca:YCS) will rise 2% for every 1% the Japanese yen falls against the U.S. dollar. It’s an exchange traded fund, or ETF for short, which means you can trade it just like a stock. It’s got a low expense ratio so you’re not throwing money into the wind on fees, and it’s super liquid, meaning you can buy and sell it easily. This is one of the very few instances where I will recommend a leveraged ETF – because of their unique makeup and something called “tracking error.” Tracking error is an indicator of a fund’s excess return. Excess return, despite what the name implies, can be positive or negative. And because an index fund’s net asset value includes fund expenses, the tracking error for them is more often negative. It’s not a major drawback because there are plenty of exceptions, but it’s usually been enough to dissuade me from recommending leveraged ETFs simply because there are better, less risky investments to make. But I’m making an exception in this case because YCS is by far the simplest way to short the yen. Right now YCS is trading at $65.37 per share and I think it could double in the next 36 months or sooner, depending on how aggressively Abe goes after things. Remember… he has no choice. Abe has to devalue the yen if Japan is to survive. Incidentally, I’ll be there again next week, so I’ll have an update for you in the weeks ahead. Thanks for the kind words Stephen. As always, do so in keeping with your own individual risk tolerance and objectives. Could we not do this with options?? Yes, you sure could. There are options on YCS itself, options on futures contracts and options on currencies, too. The challenge, if you can call it that is that you are going to have to make some assumptions about timing because every option has an expiration. YCS can run “hands off” while the politicians fight it out. Keith – is there a long option we could use to give this time to work? Hello Marilyn and thanks for asking. Yes, there are actually several however picking one – the the point I made above in response to B. is that there’s an element of timing involved. There’s also the matter of which strike prices you want because that can alter the equation, too. Perhaps there’s a column in here somewhere…let me chew on this. In the meantime, if you could refine your question a bit, then I could use that as the basis for the article. Excellent article, Kieth. Last year you wrote an article about how Japan was going to lead the way in robotics, and that it would boost there economy. You mentioned that you were meeting with several firms. You have a great memory RJ. I did meet with several and will be doing so again. While their products were really cool, they were not quite to the point where I’d feel comfortable recommending them…yet. But that day is coming so stay tuned! Alternatively:Short the FXY, or long-term FXY puts? There’s also the so-called Shanghai Accord, (which may or may not exist). The likelihood that the IMF et.al. would allow a 50% weakening of the Yen, even over 3 years, is questionable at best.